By now, there shouldn’t be a horror fan reading this who isn’t familiar with the work of Leigh Whannell. Having previously penned films such as Saw, Insidious and Dead Silence, the screenwriter/actor has proven himself to be quite the asset for studios looking for bold new intellectual properties. So, as was the case with Insidious: Chapter 3, he’s writing and directing the upcoming science fiction/action flick Upgrade, which I must admit is taking me by surprise. As you can imagine, I naturally thought this to be a horror movie upon first hearing that Whannell was behind it, but I’m pleasantly pleased that the footage I’ve thus far seen has defied my expectations. Leading the way as Trace is Logan Marshall Green (Prometheus, Snowden, The Invitation), who’s able to pull off some rather fancy moves, all the while making it look like he’s not in control of his own movements. It may add a measure of comedy, sure, but it doesn’t detract from the sheer badassery or levels of gore that’d make even Eli Roth blush. In addition to Green, other key members of the cast include Betty Gabriel (Get Out, Purge: Election Year), Harrison Gilbertson (Picnic at Hanging Rock, Hounds of Love), Simon Maiden (The Dressmaker, Killer Elite) and Benedict Hardie (Hacksaw Ridge, The Light Between Two Oceans). 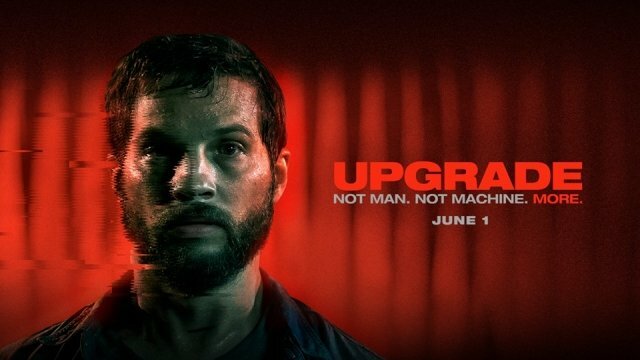 Upgrade arrives in theaters on June 1st.